listed as L.A. Times' Home of the Week. 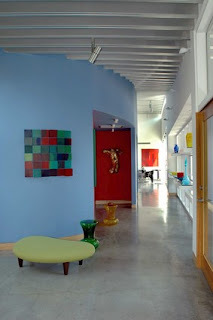 Artist Nancy Louise Jones and her husband, entertainment executive John Richard Diaz, bought a 1,000-square-foot tear-down in Mar Vista five years ago, they didn't know that they would transform the property into this ancient-Mexican/Modernist fusion of architecture. The hacienda, where they "work, live and play," was designed by the late artist and architect J. Frank Fitzgibbons. 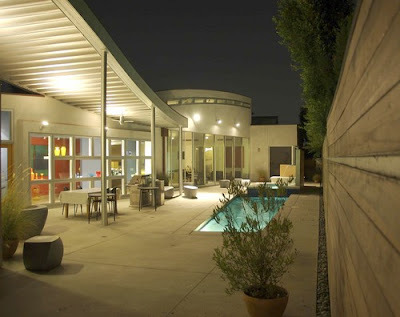 The enclosed compound, dubbed Casa Moderna, includes 3 bedrooms, 4 1/2 baths, a great room; a large, high-ceilinged artist studio; an office with a full bath and steam shower; a side yard for entertaining; and a large backyard with drought-tolerant landscaping. Around 16,000 sq feet of mingling and business space, the interior is saturated by natural light, and is painted in bold colors including marigold and cobalt blue. I think I can get alot of work and play done in this flat, I'm proposing this to be the new L.A. Etc work-play-blog-quarters...one of 'em at least. This casa is listed at 3.995 million.